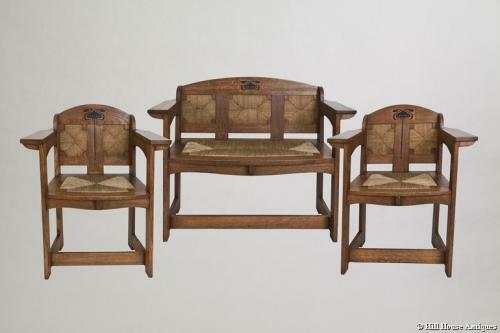 An incredibly rare and truly iconic oak & rush seated Arts & Crafts three piece suite designed by EG Punnett (of William Birch of High Wycombe) for Liberty & Co; c1901. The lone armchair has become a statement piece in it’s own right, with examples held at the V&A Museum in London and elsewhere. This is the first time we (or indeed any one else it seems) have ever seen the expanded settle version; not recorded in any of the usual books, out of print or otherwise, nor indeed in the William Birch archives, as with other Punnett suites. The relevant experts at the Furniture Research Centre at Buckingham University, who hold the archives, have been to visit and indeed confirmed that the settle may be a one-off design for a client. The suite will also be the subject of a specialist research article written by them in the near future. The armchair was apparently EG Punnet’s first (and most successful) design for them; design no. 906, as illustrated in the William Birch archives. Chairs: h: 33.5" d: 20" w: 28"
Settle: h: 33.5"d: 20" w: 42"